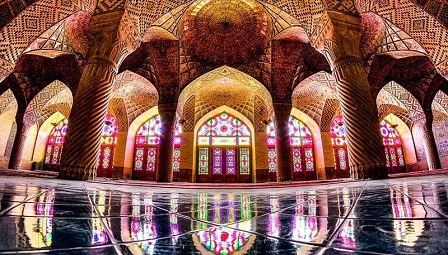 The Vakil Mosque (Persian: مسجد وکیل‎‎ – Masjed-e Vakil) is a mosque in Shiraz, southern Iran, situated to the west of the Vakil Bazaar next to its entrance. This mosque was built between 1751 and 1773, during the Zand period; however, it was restored in the 19th century during the Qajar period. Vakil means regent, which was the title used by Karim Khan, the founder of Zand Dynasty. Shiraz was the seat of Karim Khan’s government and he endowed many buildings, including this mosque.